From this point, you can use the app to view and reply to messages, change your settings, see your account activity, and post updates to your ongoing Kickstarter project. From the dashboard, tap Messages. The app by default takes you to your inbox, where you can scroll through the previews of any incoming messages (much like a preview pane on your e-mail account). To open a message, simply tap it once. The full message pops up onscreen. To reply to this message, tap the icon that looks like a backward-facing arrow in the top-right corner of your screen. Type the reply to your sender using the keypad; then, to send your message, tap the arrow (at the top-right corner of the green box) that looks like a paper airplane. You are returned to the original message and you see the reply below it. Tap the return-arrow icon at the top-left of the screen to get back to the main part of the Messages functionality. You can also review any sent messages by simply tapping the small green down-facing arrow just to the right of where it says Inbox. You will see an option to review your sent messages by tapping the paper-airplane icon here. The dashboard provides a quick overview of everything going on with your account; you can use the Activity button on your dashboard to see everything that has happened with your account — including your updates, new backer pledges, and pledge increases from backers — all in a chronological format. The very first item you see when you click Activity is the most recent thing that has happened with your account. This could be a project update you’ve done for your backers after a successful campaign, a project update for a campaign in progress, the most recent pledge you’ve received, and so on. If you’re a Facebook user, it’s helpful to think of this section as working like the Facebook Timeline model: All the things that have happened in your campaign appear here, in chronological order from newest to oldest. 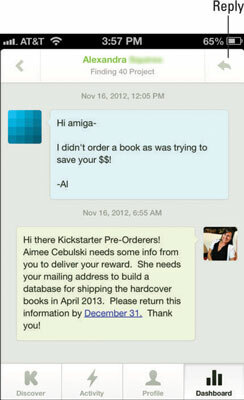 The Kickstarter app is a powerful tool for posting updates about your project. For example, the app can be extremely helpful if you want to do a fast update from the field, such as during a film shoot or product test. Tap the icon to launch your dashboard. You see a large green button right in the middle of the screen that says Post Update. Tap Post Update to see the update screen. 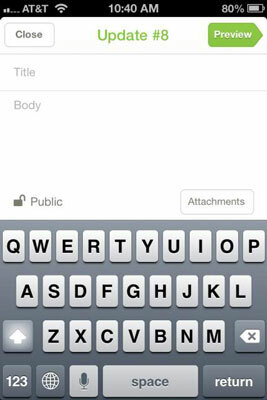 Using the iPhone keypad, type a title for your update and then type the body of the message you want to send to backers. 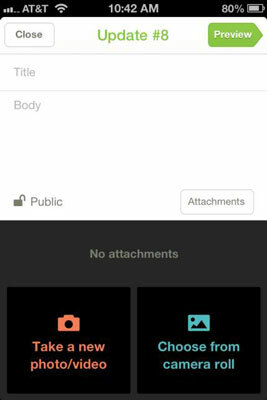 To attach media (such as photos or videos), tap the Attachments button. This screen allows you to attach files to your update. Tap Take a New Photo/Video if you want to take new photo or video in real time. Tap Choose from Camera Roll if you want to upload existing media from your camera roll. Choose whether to make the update public or for backers only. The lower-left corner of this screen shows an open-lock icon that says Public. Leave this alone if you want everyone to be able to see your update. If you want your update only viewable by backers, tap that icon: The icon switches to a closed lock and says Backers Only. You can make the choice — if it’s an update that might be of interest to someone considering your project, make it public; if it’s something specific or private that you want to share only with people who have already committed to fund your campaign, change the icon to Backers Only. Tap the Preview green button on the top of this screen to get a look at how your update will appear onscreen. If something seems off or you notice a typo, click Edit on the top left and go back to correct the post and tap Preview again. When you’re satisfied with the update, tap the green Publish button at the top-right of the screen to make your update live on your Kickstarter page.